Bayh, Birch. One Heartbeat Away: Presidential Disability and Succession. Indianapolis: Bobbs-Merrill Co., 1968. ___. The Twenty-fifth Amendment: Dealing with Presidential Disability." Wake Forest Law Review 30:3 (Fall 1995). Bayh, Marvella, with Mary Lynn Kotz. Marvella: A Personal Journey. Epilogue by Birch Bayh. New York: Harcourt Brace Jovanovich, 1979. Lilly Library (Indiana University, Bloomington). 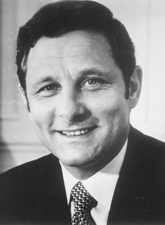 The Art of Leadership: A Companion to an Exhibition From the Senatorial Papers of Birch Bayh, January 29-May 5, 2007: United States Senator From Indiana, 1863-1980. Bloomington, Ind. : Indiana University Libraries, 2007.